PART 2 – A fascinating look into how to create wreaths, whether for wrapping a pillar or hanging from a frame it gives us an idea of how the Victorians created wreaths and what kinds of plants went into them. Taken from the book Flowers for Ornament and Decoration. They are often made in ways that take up a great length of time ; whilst in all these arrangements most frequently the simplest sort, and the quickest done, are also the most graceful. Some take strips of calico and sew the foliage on them; others prepare long stiff cords and bind it down upon them ; and a third party, who, I think, do best, take a succession of small green branches, and bind them continuously together, without any other support than that afforded by the overlapping stems. In proceeding thus, the first piece of green used for commencing the wreath should hare a longish stalk, and all the pieces should have a few inches left of bare stem for binding over. All the pieces should be trimmed into a proper size for the thickness of the wreath. 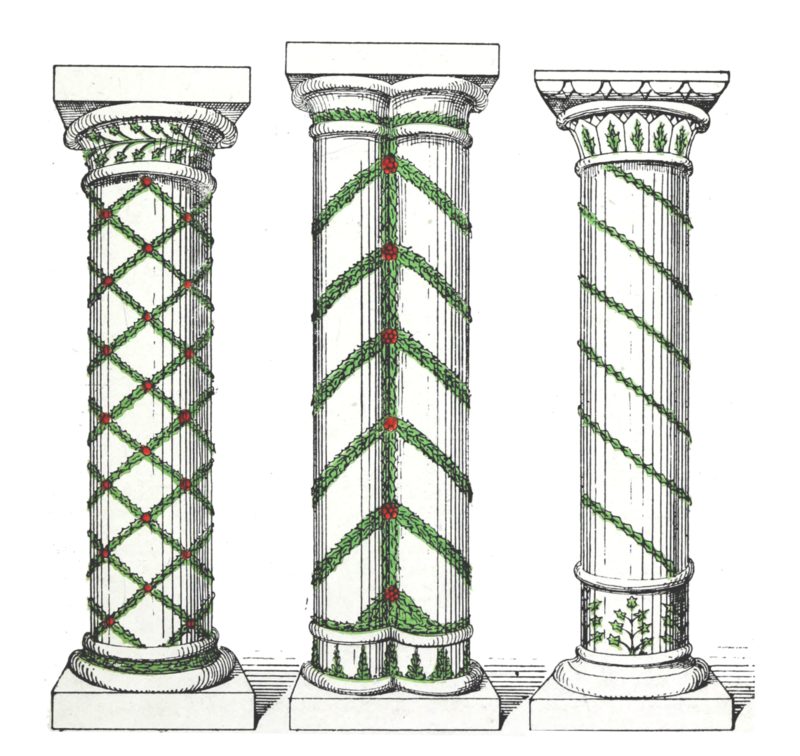 For twining round pillars, the wreaths can hardly be made too large ; And when there is not material sufficient to make them really handsome (and they do take an enormous quantity), I think it looks much better to have one immense drooping wreath of Ivy and spreading Fir placed round the top or capital of each pillar, the entwining of the shaft meanwhile being left quite unattempted. 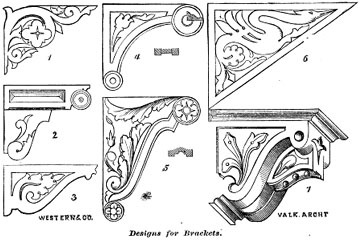 A very pretty way of decorating any large massive piece of stonework — a font, for instance, if in a church, or a statue, or a doorway, or for deeply- cut niches, as for a deep window-frame is to take a few flat fan-shaped branches, and without any attempt at fastening, lay them down in the manner of a wreath round the base of the pedestal, or in the angle of the recess, or along the front of the sculptured niche. In arranging the decorations of a hall or gallery filled with statuary, this would be found a most rapid and effective plan. For all these purposes variegated foliage is not generally much to be recommended ; and when it is used it should never be mixed with any of a darker kind. The only way in which I think it looks really well is in a massive wreath hung in the strongest light ; and in a place where it will either produce a harmonious effect of colour, or where it will be near enough to the eye to be distinctly recognized as what it really is. It should never be used on a background of green, whether light or dark – unless, indeed, the foliage is very nearly white. Even then, however, dark green is very cold and heavy for it to rest against ; crimson does far better. From some effects of colour I have observed lately out of doors, I fancy that a dark bluish-purple would be a rather good contrast ; but this does not sound very natural, and I cannot answer for its success in practice. For the large green wreaths a great quantity of Fir branches might be used with advantage. Box does well also, only it is not often to be had in quantity, and should be therefore kept for the smaller wreaths, where these are required also ; Portugal Laurel does pretty well. Ivy the best of all, and common Laurel tolerably. Holly looks very bright and glossy, but it must have no berries ; and Laurustinus would be very useful sometimes, if it were not for its too numerous flowers, which in a wreath of large size are not at all admissible. 5. For picture-frames and looking-glasses nothing looks more beautiful than a wreath of Arbutus adorned with its scarlet berries ; Laurustinus and Snowberres being thickly intermixed, and the whole crowned by a bouquet of the various mingled foliage. Fern leaves are most useful for such central bouquets ; and on a larger scale in some cases, as in harvest time, a triumphal arch crowned with handfuls of ears of com, arranged one up and one down, and tied together loosely in the middle, is very appropriate and pretty. I always wonder very much that in the apple counties the beautiful bright red fruit is not more made use of for open-air decorations ; I never once remember seeing it ; and yet how very beautiful the glowing crimson fruit looks clustering amongst the leaves. In the apple counties I know it used to be “not the thing ” to have apples brought to table ; but this rule, I think, is being properly broken through, now that prize fruit is thought so much of; so perhaps in this case also it will become more sought for, and there may be a chance of seeing some of the bright colouring which those peculiarly bright-faced little crab-like Apples would lend to an arch in autumn. For very small wreaths for following the lines in delicately carves woodwork, or for the tracery of an open device in wire, the little pieces of Box are the very best of any, where, as is usually the case in England, a sufficiency of Myrtle is not to be obtained. These little sprays are far better when of a naturally compact and branchy shape. 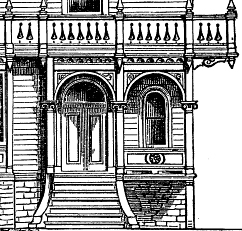 They cannot, indeed, be too neat, and can scarcely be too short ; as the shorter each piece is, the closer and neater generally is the wreath itself. In all these arrangements we are supposing no flowers to be used, the green alone forming the ornament. When, however, flowers are added, I have found it answer best to put them in after the wreaths are fastened in their places. Often it is easy to slip in the stalks ; otherwise, when mounted on wood or wire that will pierce the mass of foliage, or even by means of a little wire, the flowers may easily be attached outside. The flowers should be carefully made to follow in the fall of their foliage the direction of the leaves, although it seems useless to strive against the great objections to making them up together — namely, the time the wreaths take making, and the rough treatment which they have to suffer. The flowers being only afterwards attached, can very easily be removed and replaced if they fade too quickly. I dare not say how long I have known the green itself continue to look well, fully extending over all the season of the Christmas gaieties. Perhaps it may be useful here to describe exactly a device of this kind ; and I think that a monogram, or device, or cipher, surrounded with a wreath, will be the best design to give, as it includes both green and coloured work. Say, then, that the device is to be a cipher or a motto on a shield, surrounded by a wreath. The letters should first be traced upon the stiff piece of canvas stretched upon a hoop. Card would do, but calico or canvas is far better. The very simplest-shaped old English letters are the best to use; and after they are drawn in outline upon the canvas a strong solution of gum should be laid all over it, omitting with great exactness the spaces of these said letters. The whole ground should then be closely covered with Snowberries or some other white berry, or with white everlastings ; or, in fact, with anything in the vegetable world that can be made to look really white and pretty, while retaining a flat surface. If flowers are used, the gum will perhaps be exchanged for the use of a needle and thread. 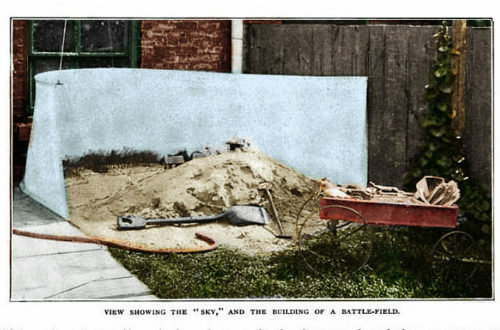 Or, if the letters can be provided for in flowers, the ground may be all of Holly berries, which, though I name it last, is most to be advised ; but Christmas time is a difficult one to provide for, and this device might serve for use then as well as in the summer time, when scarlet and white Verbenas are waiting to fill the canvas. The ground being prepared, the letters have to he filled up very closely and fully ; and it is sometimes even well, with a pair of scissors, to clip off any leaf or petal which creeps beyond its bounds. Scarlet looks well for the letters, but nothing does better than golden words on white. For making the frame, a prettily shaped piece of green should be laid either way in the hand, and bound together in the centre with some feathery pieces, to conceal the join. The wreath should then go on each way ; and I may here mention that acorns and Oak leaves in autumn, and Laurel leaves at other seasons, make a beautiful frame-wreath, even quite alone, especially when the scene and the devices are of a warlike kind. Otherwise a beautiful spray of Arbutus and Snowberry, with Laurustinus at the top, and a sort of knot of the same underneath the frame, would best combine the two separate lengths ; each drooping downwards if of a creeping kind of foliage, or pointing upwards if of the Laurel class, and being made tolerably even as to their size all round.